Have you guys heard Taylor Swift’s song, “Shake it Off?” If you answered no, I have to know how you’ve managed to avoid it since it plays on the radio at least 5 times during an average work day. It’s awful I LOVE IT! When I first heard the song, I thought there was a brief moment where I thought Taylor was really into muffins…or cake… I was pretty sure she was singing about my favorite people! I mean, bakers are heart breakers when you roll in expecting to get a connoli and it turns out that there are none left. 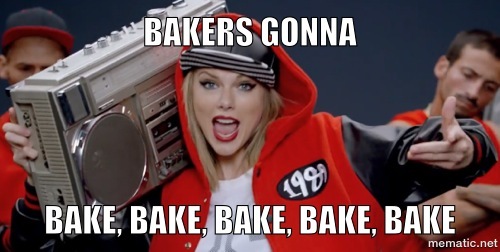 I’ve cried a few times leaving my favorite bakery, I won’t lie…. So what does this have to do with anything? nothing honestly, except it makes me laugh every single time I walk through our 100,000 sq/ft showroom and see the bakery cases. Speaking of bakery cases, as part of our HUGE END OF THE YEAR sale, all of the dry bakery cases are on sale for $899! Did you hear that? $899! That’s a crazy low price! You need to get your baking butts down here and get the dough ball rolling! We only have a select few left and they’re going fast! These cases are sold on a first come – first serve basis! You knead to head over here! Donut miss this sale!